Exclusive Woodworking architectural millwork and cabinetry is John Durbin’s childhood vision realized. John’s passion for woodworking began in high school shop class where he nurtured his talent throughout his teenage years. An apprenticeship with a master cabinetmaker immediately after high school provided intensive technical training and inspired John’s appreciation for quality and craftsmanship. 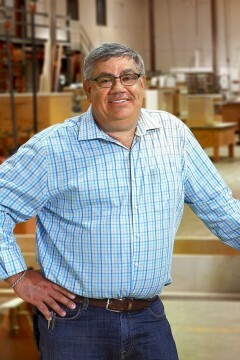 In 1983, John and his brother Doug founded Exclusive Woodworking, with the goal of building cabinetry, millwork and fine furniture of uncompromising quality. The family owned-and-operated company is the embodiment of the Durbin’s shared respect for their craft. As CEO of Exclusive Woodworking, John Durbin sets the standard of excellence that has made Exclusive Woodworking a sought after industry partner. Thanks to a mastery of old-world techniques, leading-edge technologies and reputation as a careful, capable project steward, Exclusive Woodworking has completed thousands of complex and prestigious projects across the country. John, an avid Grateful Dead fan, resides in Waukegan, Illinois with his wife Cheryl where they enjoy golf, snow shoeing, entertaining, and long walks with their dogs. John is also involved in Lambs Farm in Libertyville, Illinois, an organization renowned for its commitment to help people with developmental disabilities lead productive, happy lives and connecting with the human spirit in us all.